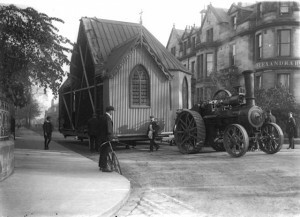 It may seem surprising that one of the first venues used regularly for moving pictures within St Andrews was a former Roman Catholic church. 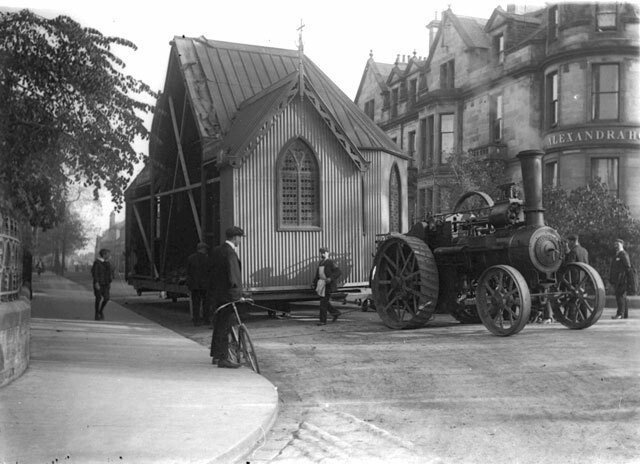 What is even more striking is that this church, previously situated on The Scores, was dismantled into sections and transferred across town in 1909. 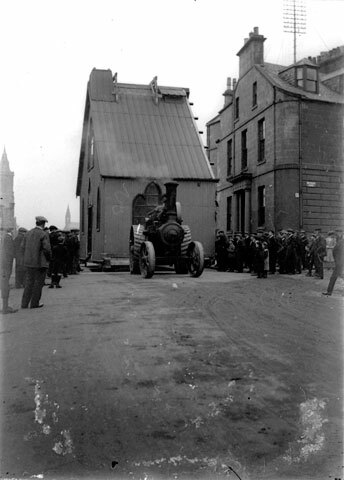 As work on a new church began, Jock Spence bought the existing building and used a steam traction engine to move this corrugated iron and wood structure a mile to its new resting place at James Street (often advertised as South Bridge Street or Largo Road). After its first screening on 30 December 1910, the building showed cinematograph shows every Thursday, Friday and Saturday. The admission prices were 1/-, 6d, and 3d and the room could seat 600. The local newspaper advertised these initial shows as ‘Instructive, Interesting and Amusing.’ On Monday, Tuesday and Wednesday, The Citizen explained, it was ‘skating as usual’. There was also a continuing interest in local and topical pictures. A ‘Courier’ film was widely advertised, while in 1912 a programme promised to show ‘all the golf champions and well-known local golfers’ as well as ’beauty spots in St Andrews’. A film of the Titanic was scheduled in April 1912 and when a shipwreck hit St Andrews in the same year, the cinema felt the need to announce that they had no pictures of this local incident, although they did donate proceeds to the Shipwrecked Mariners Society. This donation appears as part of a broader effort by the proprietors to highlight the moral value of the cinema. This was apparent both in the films screened during 1912 (for example In The Grip of Alcohol) and in the regular notices praising Jock Spence for inviting inmates of Gibson Hospital to his shows. In addition, as both David W. Lyle and Robin Evetts note, the audience was ‘obliged’ to sing a hymn, conducted by a minister, before the films were shown on a Sunday evening. Given the building’s former function, it is appropriate that amongst the most popular films shown at the venue was The Passion Play. This film was shown on at least three separate occasions and reportedly led to patrons being turned away at the door. Throughout this period, the venue would change name, management and function. During the summer of 1911 it even stopped showing films. By November, film was appearing again every Friday and Saturday. Jock Spence now promised ‘at enormous expense, the greatest programme of high class up-to-date Cinematograph pictures ever shown at St Andrews.’ And still they skated. By the summer of 1912, the Skating Hall had become the ‘Picture Theatre.’ It would now include variety acts such as Coney Barr, a female impersonator, as part of a live performance accompanying the film show. The Picture Theatre would change its name again in 1913 to La Scala. The venue now faced fresh competition as a new purpose built cinema, The Cinema House, opened its doors in December 1913. Read more on La Scala here.